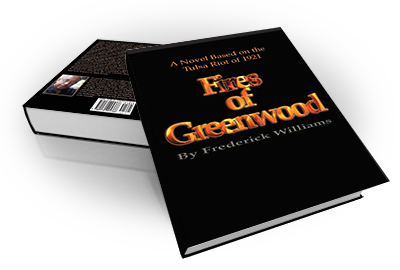 The Fires of Greenwood, a novel about the Tulsa riot of 1921, by Frederick Williams, chronicles the events that led to one of the most horrendous slaughters of American citizens in this country’s troubled racial past. With a stroke of creative ingenuity, Professor Williams immerses the reader in the personalities of the real people central to the events. We see the power brokers of Greenwood juxtaposed against the debate between Booker T. Washington’s Accommodationist approach and Dr. W.E.B. DuBois’s advocacy for a more radical protest against segregation. The divergent ideologies become real in the streets of North Tulsa where Black Americans have built economic independence and successful businesses to the degree that the area is termed “The Black Wall Street”. These businesses are destroyed by fire and over three hundred lives taken at the hands of marauding racists invading the area called Greenwood. Professor Williams premise and reason for writing this novel is that neither the Washington nor the Dubois approach would work in a country where all the institutions of control were determined to keep Black people down.